Are pop-ups really suitable for shell scheme stands? Some of our top selling items are printed cassette banner stands and pop-up displays. They’re colourful, quick, reusable and the large format graphics do a great job of showing off your brand, and the last decade has seen plenty of innovations, particularly in pop-up systems, so they are easier to assemble, more stable, and lighter than ever before. In fact, pop-ups and banner stands are perfect solutions to creating small branded environments in all sorts of places, from conferences and open days to job fairs and public product activations. 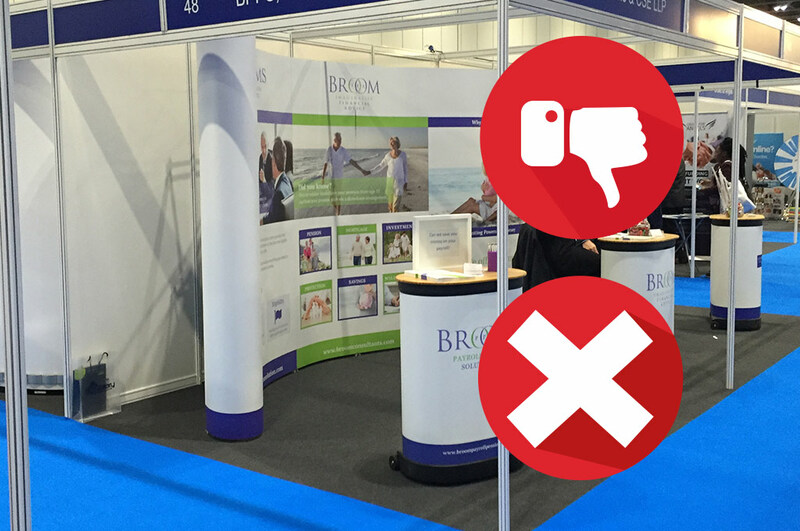 But – and it’s a big but – take a walk around any major B2B or B2C exhibition today, and you’ll see a proliferation pop-ups and banner stands adorning exhibitors’ shell scheme stands. 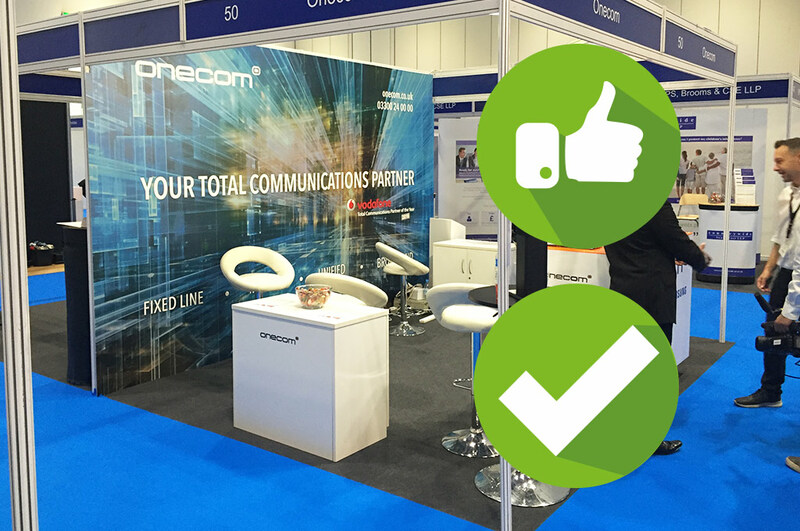 It’s not hard to see why – businesses appreciate the ‘invest once – reuse indefinitely’ life cycle of free standing temporary graphic displays, and the savings to be had from personally lugging the graphics in and out of the exhibition. But from an organiser’s perspective, how does this tendency affect the overall impression of an exhibition? Frequently, exhibitors opting for shell scheme will be offered a graphics package of some description – from foamex panels attached to shell scheme walls, to a simple header graphic and nothing more. With choices like that, it’s no surprise that exhibitors will choose to haul their own graphics to the exhibition, laboriously carting their displays through the morning rush hour and arriving sweaty, frustrated and ill-prepared to wrestle with a stubborn and awkward pop-up system. Because the shell scheme stand dressing is now entirely in the hands of the exhibitor, it’s also at the mercy of their pop-ups and roller banners. Sometimes they will look amazing, especially if the exhibitor has gone to the trouble to make sure the displays fit the space precisely, with neat rounded ends and all of the finishing touches the manufacturers intended. But as we all know, exhibitor graphics are often put up at speed and without the creative eye needed to make them work to their best effect. Too often we see pop-ups leaning at jaunty angles, with coats and bags tucked behind them, abjectly failing to project the image that the exhibitor might really have wanted. So what can be done? Typically, a 3x2m shell scheme unit fitted with a pop-up display at the back, and a couple of banner displays at the side, will lose about half of its floor area to graphics. Whichever way you cut it, that’s not very efficient. The alternative, printed boards attached to the shell scheme with hook & loop tape, doesn’t really get the pulse racing either! The exhibitor wins back half their stand, but now has to accept that their amazing graphics will be split, triptych style, into several sections and divided by intrusive vertical aluminium spars. It all still looks very shell scheme and basic, and a stark contrast to the custom built stands that may be ranged alongside them. Organisers do have a ‘secret weapon’ for raising the visual impact and appeal of shell scheme, and it comes to us through dye-sublimation (dye sub) fabric printing. Tensioned fabric is amazing – it’s flexible, durable, reusable and rolls up very neatly for transport. Dye sub printed fabrics are every bit as vibrant and sharp as pigment printed boards, and because they are printed onto a roll, they can be almost any length. By the simple expedient of using dye sub printed fabrics, tensioned over the shell scheme, in place of printed boards for exhibitor graphics, every shell scheme exhibitor can enjoy the benefits of eye-catching, continuous, space efficient graphics, and a shell scheme experience that’s a cut above the rest. Not only do they look superb, but they are also eminently reusable, and tend to suffer less wear and damage than rigid graphics. But the real payoff for equipping exhibitors with a dye sub printed fabric package from the organiser, is that it will lift the quality of the whole show by giving the shell scheme a consistency and quality that an exhibitor’s own graphics simply cannot match. Additionally, the extra space created by removing the portable systems from the stand provides a blank canvas to offer some stylish furniture to make the space functional as well as visually stunning. In an ideal world, every exhibitor would be exhibiting on a bespoke stand, and every stand would be visually unique and compelling in its own way. But in the real world of marketing budgets, not everyone can, or wants to, spend the required budget on a custom designed stand, preferring instead to choose shell scheme. The challenge for organisers, in creating that great exhibition, is to ensure that the perception of consistent quality extends from the space only exhibitors and feature areas to the shell scheme exhibitors too. This means providing them with high quality, economical, organiser graphics to help them make the most of their brand and exhibiting opportunity. Pop-ups and cassette systems do have their place, but world of exhibition and conference graphics has moved on, and I believe its time for organisers in particular to up their graphics game, and make shell scheme really start working for exhibitors. This entry was posted in Exhibitions and tagged Shell Scheme Stands. Bookmark the permalink.